But little does he know about the Motel’s unsavory history. Hidden in the corpse of trees and about 400 miles away from his home, it is a two-storey facade located in the dark forest of Skiddaw.With no WI-FI, poor signals and weird set of rules, the dark atmosphere soon turns his seemingly idyllic trip to a living nightmare. Apart from the usual creaks, groans and moans of the motel, he soon finds himself face to face with an entity. An urban legend that is lurking in the woods long before the motel found its existing foundations. The Motel’s dark and haunting history quickly becomes tangled with Alfred’s life as he frantically searches for answers. Barry, the caretaker is hiding something. But what is it? Is there someone else living in the motel besides him? Or is caretaker not what he seemingly appears? It's been a long time since I read some serious horror/ thriller. This book made me finish it in one go. It is definitely one of the best on the edge thrillers. The writing style is very casual and easy to understand. The book cover obviously is very interesting to pick up the book. The blurb is also tempting enough. The story is about an author(Alfred) who lacked motivation from a long time to finish his book and comes to a haunted hotel unknowingly searching for a peaceful undisturbed environment to finish his book. The story starts out with a brief introduction about Alfred and goes through his experience in the creepy motel. The mystery is maintained until the end and the twists are very unpredictable. My only complaint about this book is that it could have been edited better. There are some grammatical mistakes that were overlooked during editing and it surely disappointed me. Other than that, the story is dealt in a good way as required for a horror novel. I felt the climax is quick though unexpected. It might have been more clear. I recommend this to every reader who loves horror and on the edge thrillers. This wonderful book kept my attention throughout. Moreover, it's free on kindle today and tomorrow. Check it out! 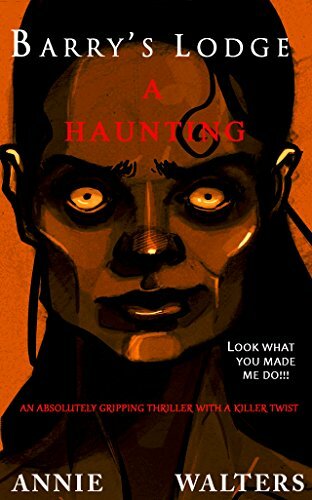 Annie Walter is an upcoming British Author who has grown up listening to stories like the Fall of the House of Usher and The Tell-tale heart.She is a huge fan of Sir Edgar Allan Poe, Stephen King and what not and is a doctor by profession. When she's not diagnosing her patients, you would find her in the local library, buried under tons of books, digging out tales of the macabre and horror. Currently she is living in a crooked little house in Wales with a crooked little cat called George who's always preoccupied with sinister thoughts of murdering her.